Most modern homes have some great privacy and as such, they have very long driveways. However, this presents some security challenges, since you cannot see the whole driveway from your window. You will need to take up serious security measures so as to keep intruders away. Driveway alarms are a great solution to this as long as you can find the best driveway alarm. There are different types of alarms and sensors that you can install for your driveway. However, you will need to establish which would be the right one. This will serve as an alert and you can keep the burglars away. These alarms are effective and you will not need a security guard to watch out for any intruders. In this guide, I will cover some of the top-rated driveway alarms in 2019. I will also share with you some of the best tips that will help you pick an alarm or sensor that will serve your needs in the best way possible. It is my sincere hope that at the end of the guide you will be in a position to make an informed buying decision. Why Install Driveway Alarm Sensor? There are so many reasons why you may want to consider installing a driveway alarm sensor. This is a great way to enhance your security as you will be able to tell when someone gets into your property. Your alarm will be triggered when someone passes a certain point on your driveway. These sensors work better when they are integrated with a security camera. Whenever the alarm is triggered, it will capture live images of the intruder. You will come across modern alarms that have different sounds that they will produce when they go off. Any burglar that hears the sound similar to a police siren will not wait any longer, but will run for their safety. Whether you are at home or not, having an effective driveway alarm is a great idea. Before installing any alarm or security system on your property, it would be a great idea to have a clear understanding of the functionality. After all, is said and done, there are so many benefits, in terms of the security of your property that come with driveway alarms and sensors. 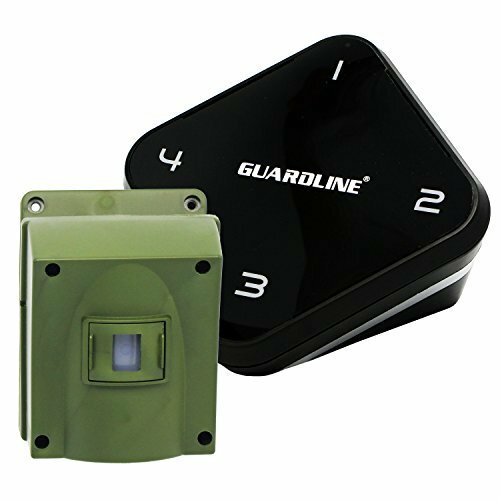 If you are shopping for a wireless driveway alarm, the Guardline is certain the best wireless driveway alarm. You will love the fact that you can customize it to serve your needs. It comes with one sensor and a receiver, with the option of adding countless receivers and up to a maximum of 16 sensors. With this model, you will have over 30 alert sounds to choose from. When the alarm goes off, there is a red LED light that will be emitted. It is rather expensive compared to other types of alarms, and for sure it is worth the price. The only time that this kit seems not to work is when it is exposed to direct sunlight or having to pass its signal through metal. This is the driveway alarm to go for if you looking for efficiency couples with flexibility and versatility. 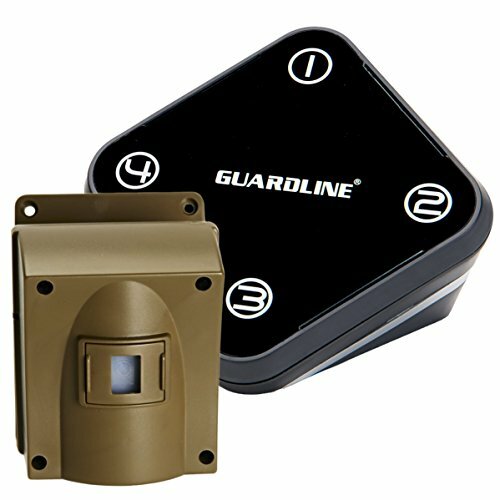 This particular model of Guardline Driveway Alarm will be able to detect motion that is a ¼ mile away. This is a realistic range and has been tested in areas with trees, buildings, vehicles and people and works perfectly. You do not have to a technician to install it as it comes with a clear guide and the setup is easy. While it comes with a single sensor and receiver, it is an outdoor alarm that is expandable. You can add 16 sensors and as many receivers as you would please. This has been tested and proved to be reliable and dependable. It has a heavy duty PVC, which withstands the outdoor environment. You can adjust the volume to your preference and this is a wireless model, eliminating the need for several cables and wires. Hosmart has been in the business of producing high quality alarms for the last 3 decades. 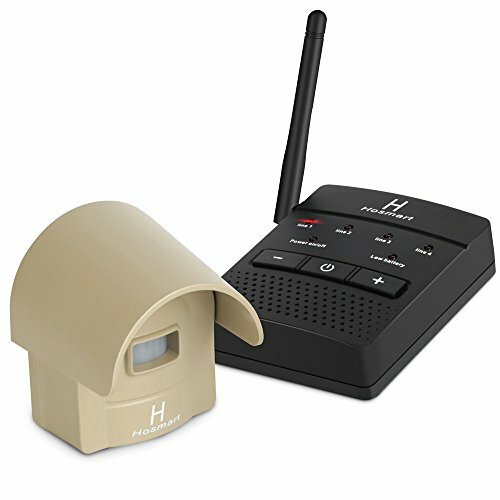 This model is a show of their exceptional quality and it is one of the most effective wireless driveway alarms. You will get a guide, which makes it easy to install. It has one sensor, which can be expanded to 4, while the receivers can be unlimited. You will also get at least 4 chimes, which are unique and fun. The biggest advantage of this alarm is that it allows you to configure it to your preference. You can adjust the distance, sensitivity and the volume, among other features. This a great option to consider if you have a long driveway. 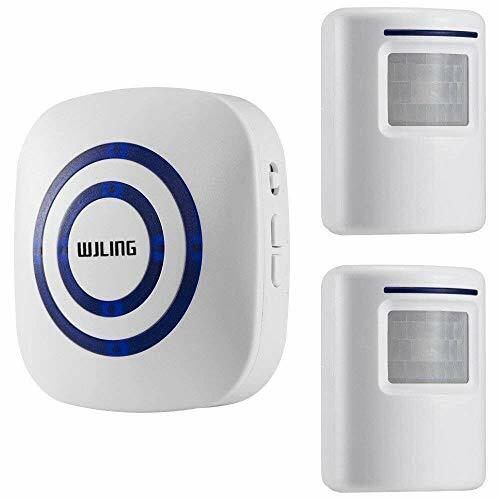 The WJLING motion sensor work with infrared, which makes it a wireless model as well. It is easy to install and will just take a couple of minutes and it will be up and running. The sensor can easily mount on your wall. This motion sensor alarm provides up to 38 tones that you can choose from. There is a very bright LED light on the alarm. You will need 3 AAA batteries for the sensor. The detection delay time can be configured for up to 30 seconds. The driveway alarm will work up to a distance of 100 meters, which is a safe distance to warn you of any intrusion. You should keep is covered from the rains as it is not waterproof. You can adjust the volume to suit your needs. 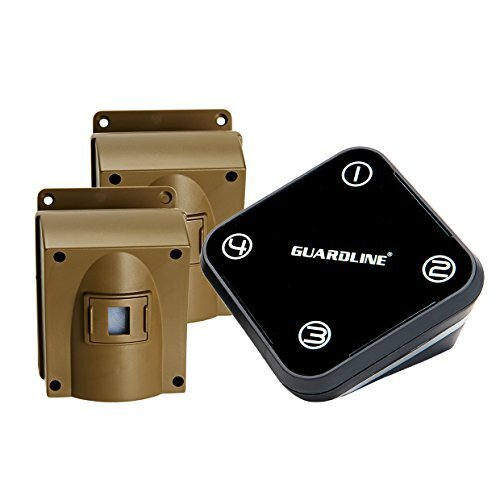 This is yet another Guardline wireless driveway alarm. This is an advanced model as it comes with 2 sensor kits, enhancing its efficiency. The motion detector is easy to use and you can install it by yourself. It comes with a compact receiver, which runs on AC power and has a battery backup. There bright LED lights and a loud alert chime. When you purchase it, you will get a mounting bracket and it also has a protective covering. With the 2 sensors, you get to enjoy coverage for 2 zones. This models has been tested and will work irrespective of the weather or environment. This is, in fact, ranked among the most dependable motion detectors. It offers a practical range coverage of 500 ft. and it is built to serve you for a very long time. Just imagine having a driveway alarm system that is guaranteed to work throughout? 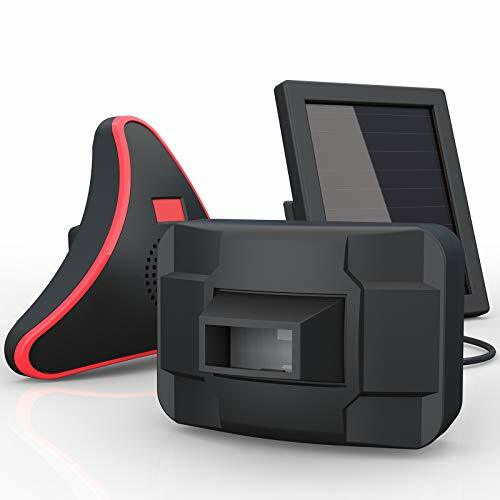 This is what the Htzsafe Solar Driveway Alarm offers. Yes, you read right, it is a solar powered model, with built-in batteries that will recharge, always. What you will love about this model is the fact that you will never have to replace the batteries. You will enjoy a transmission of ½ mile long and the sensor has a 50 ft. wide detection. You can expand the system to hold 32 sensors and the receivers can be as many as you please. You will get to choose from 35 different tones and there are 4 volume adjustment levels. Enjoy the convenience of setting different tones for different sensors, in different zones. This model is waterproof and the setup design is quite easy. 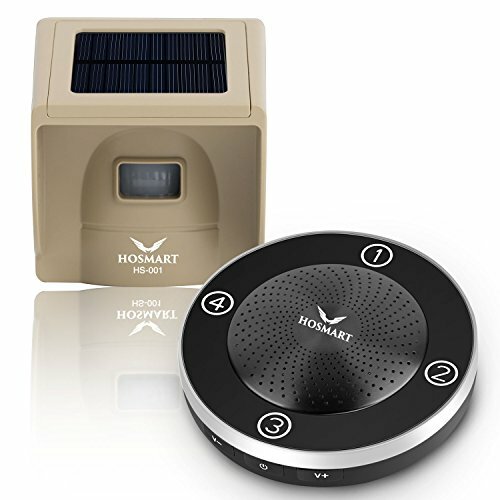 Enjoy a long range of up to ¼ mile, with this Hosmart driveway alarm. This is unique from the other wireless models as it is solar powered and had built-in receivers. You will get one receiver and 1 sensor in your package. However, you can expand it to 4 sensors and multiple receivers. This comes with over 4 different tones that you can choose from and the installation has been made easier as it has a guide. You can configure it in such a way that each area covered has a different alert tone. You will set the alarm to your desired sensitivity as it provides you 4 different settings. This alarm is made from industrial grade PVC and will last for a long time. It has a weather resistant seal, which is made of rubber. Are you seriously looking for the best driveway sensor? Then you may want to save yourself the trouble and go for the Driveway informer Wireless Driveway Alarm. This is guaranteed to keep your property and family safe, all through. This is a model that has been designed in such a manner that it will be easy to operate and will give you incredible service. With a signal range of 1000ft. you can rely on this system to work effectively on your property. It is made with long-lasting material and will not disappoint. This is a multipurpose alarm and has a long lasting battery. You will set the volume to the desired level, using the control knob. It comes with an LCD digital display that can be reset without difficulty. This wireless driveway alarm is easy to install as it has a clear instruction manual. 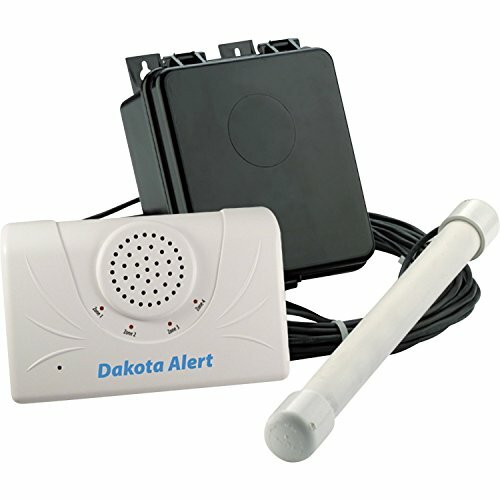 The Dakota Alert DCMA-2500 will impress you with the numerous features that it has to offer. This motion alert kit has a transmission range of a ½ mile, which is quite incredible. It runs on a single 9V battery, which is sold separately and will detect motion that is about 50 ft. away. If you have a long driveway, which leads to your house, then you will need to use this driveway alarm. This is quite reliable and effective and will never let you down. You will easily tell when anyone tries to gain entry into your property. You can a choice of 4 different alarm tones and it can accommodate up to 4 sensors. There LED indicators for all the areas that are covered. The lights work with loud beep sound and can be programmed to send reminders after the initial alarm goes off. 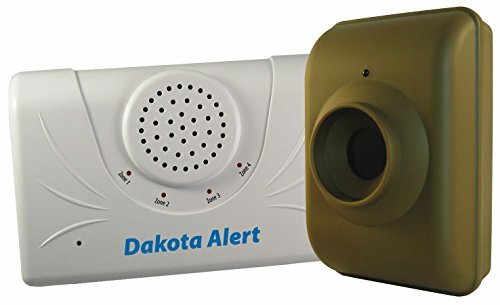 This Dakota Alert DCPA- 2500 is the perfect choice for those who would want to be alerted on any vehicles that come into their property. This is a wireless alarm and works with a magnetic probe sensor. It is quite reliable and there are no false alarms. You will need to have 4 3V batteries to run this system, and depending on your use they can last for up to 12 months. The probe sensor will be underneath your driveway and detects vehicles at a distance of about 12 feet. It will hardly detect movement of animals, children or wind. You will choose from the 4 different tunes and the alarm can be configured to have different alerts for each zone. There is an option to set a 5 minutes delay that way you can drive out or in without setting the alarm off. Finding the top quality driveway alarm may be quite an overwhelming task. There are so many different models, makes and brands, which does not make it any easier. You will have to compare a couple of features and ultimately hope that you will make a good decision. I have put together a couple of considerations that would be critical in your choice of driveway alarms. The range that your driveway alarm will cover is one of the most important factors to consider. You need to be sure how far the sensor can be from the receiver, and still be able to work as expected. Additionally, if you opt for the models that can be expanded, consider the range of the extra receivers and sensors as well. As a rule of the thumb, you should pick one that has a higher range than what you intend to use. This eliminates any chances of failed signals. Driveway alarms come with different types of sensors and this will determine their accuracy. Most alarms use the passive infrared sensors and these are quite accurate. However, there are other types of sensors like the rubber hose sensors, break beam sensors as well as metal detecting sensors. You need to consider the location that you live in and the type of intrusion that you would want to get alerts for. The sensor is essential as it will be the one to detect motion and transmit it to the signal. In the wake of technological advances, there are so many changes in the driveway alarm industry. There is a choice you have to make between wired and wireless models. The wired alarms are economical and there are highly dependable as they do not suffer from signal interferences. In addition, they use direct AC power and will not battery replacements. However, the wires may not be very useful over long distances. Wireless alarms are easy to install and they do not have wires and cables that are running all over. However, the signal may be interfered with, in areas with trees, buildings and other structures. Before purchasing any driveway alarm, you should be clear on why you want to install it and what you want it to do. There are those that are meant to detect vehicles and others will detect people and animals. You should also consider if you would want your alarm to be part of the overall home security or a standalone option. These are some of the pointers that will help you in making the right decision on the ideal driveway alarm to serve your needs. There will be other factors like the cost, features and durability that you should also consider. Before you get excited about the driveway alarms, I want you to note that there are different types of alarms on the market. When shopping around, it is imperative to understand these different types of alarms so that you can pick the right one. There are so many people out there looking for the best wireless driveway alarm. These are known to be quite effective, especially for the long-range transmission. They are easy to install and are loaded with batteries, with such a long life. Most of these alarms will be configured in the factory and all you need to do is customize them to suit your preferences. These may, however, not be effective in places where there so many trees, as the signal is interrupted. The other common type of driveway alarms is the wired type. Just as the name indicates, these come with cables and wired, which will connect the receiver and the sensor. The advantage is that they will no cause to worry about signal strength of dependability. These models do not use batteries, so there will be no case of replacing the batteries, every now and then. There are not only effective, but quite affordable. These the best suited for those who wish to detect vehicles on their driveway. They magnetic driveway sensors are designed in such a manner that they will detect vehicles that are on the move and not stationary ones. There are different sensitivity levels and as such, you will adjust it to suit your convenience. 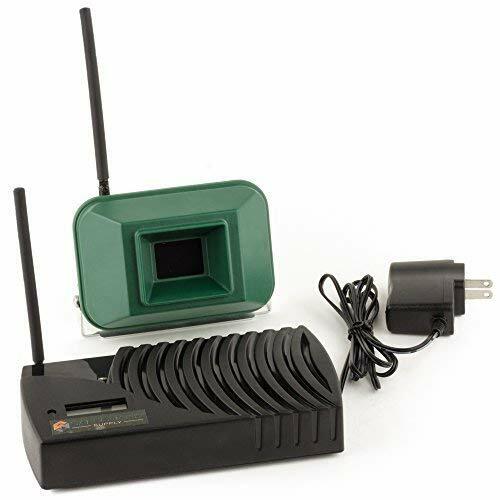 Most of the driveway alarms have infrared sensors and they have been quite popular for a long time. These are effective, affordable and reliable. You will be alerted when there is any vehicle or person on your driveway. They come with a dependable wireless range and are powered by long-lasting batteries. These are easy to install and comes with all the essential components in a single casing, which makes them compact and portable. For several decades, the rubber hose alarms have been in use. Have you ever gone to a gas station and there was a hose which you passed over and an attendant showed up? This is the rubber hose driveway alarm. You can use this type of alarm on your driveway and the hose can be on the driveway or underneath it. These are convenient and affordable for different alarm situations. These are gradually replacing the battery powered alarms. These come with solar panels that are effective and will work, even without direct sunlight. If you live in areas where there are power fluctuations you may want to consider solar technology. The advanced models will work even in winter and where it is raining. These are the main types of driveway alarms that you can choose from. 1. What does my driveway alarm give false alarms? This is a question of the type of alarm that you have installed and the sensitivity levels. You should have the sensor adjusted to specific objects and sounds so as to reduce false alarms. 2. How do driveway alarms work? Driveway alarms have two main components, the sensor and the receiver. The sensor will detect motion and send a signal to the receiver with sounds the alarm to alert you of motion. 3. How much does the best driveway motion sensor cost? The cost of driveway alarms varies, depending on the specific type, model and make. The features will also be a significant consideration in determining the cost. You should compare a couple of alarms to pick the best. 4. Is it possible to add more sensors and receivers to my alarm? Yes, you can add sensors and receivers on your alarm system. Most models allow for unlimited sensors and a couple of sensors to be added. This is to enhance their functionality. 5. How far will the driveway alarm work? There are those that will cover a long range, others will just cover a short distance. This will all depend on the type of alarm that you have installed on your driveway. Buildings, trees and other objects may affect the signal transmission. You have a great opportunity of improving your security on your property through driveway alarms. With this guide, I am sure that you will be able to make a good decision and pick the best driveway alarm. The products that I have reviewed are the top rated on the market and will give you the best security. With a driveway alarm, you will no longer have any surprise visitors or intruders on your property. Go ahead and buy the right alarm for your driveway.